Dose of Data: The Data Are Here! The Data Are Here! Happy New Year! We’re only a few weeks in and OSEP has hit the ground running! OSEP is gearing up for the FY17 State Performance Plan/Annual Performance Report (SPP/APR) submissions. As always, we appreciate the time and effort that states put into their SPP/APRs. The data and analysis in the SPP/APR provide a valuable look at the performance and outcomes for infants, toddlers, children, and youth with disabilities and their families. We are also focused on Rethink RDA and continue to thoughtfully consider how the SPP/APR, including the State Systemic Improvement Plan, determinations, and our system of differentiated monitoring and support can be best designed to support states, provide flexibility, and partner with stakeholders to improve outcomes for children with disabilities. the Higher Education Consortium for Special Education, the primary advocates for the interests of institutions of higher education with personnel preparation, leadership preparation, and research programs in special education. Finally, if you will be attending the Council for Exceptional Children Convention this week, look for the OSERS and OSEP team. It will be presenting, facilitating listening sessions, and engaging in dialogue. 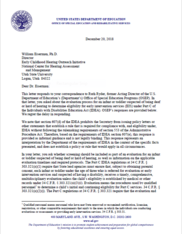 Dec. 20, 2018: Letter to Eiserman addresses the evaluation process for an infant or toddler suspected of being deaf or hard of hearing to determine eligibility for early intervention services under Part C of the IDEA. OSEP's Monitoring and State Improvement Planning division conducts many state-focused activities under the umbrella of Results Driven Accountability (RDA). You can read more about this innovative initiative to target educational results for children and youth with disabilities and their families here. Additionally, OSEP is examining RDA as a part of the Office of Special Education and Rehabilitative Services RETHINK framework. OSEP's Jan. 17 national technical assistance call focused on the FY2019 IDEA Part B and Part C grant applications. The FY2019 grant award packages and resources to assist you in completing the application are available here. Contact your state lead with any questions. The FY2017 State Performance Plan/Annual Performance Reports are due Feb. 1. Reach out to your state lead with any last minute questions. The 2016-2017/2017 IDEA section 618 data files and associated documentation and products are now available. In addition to state-level data files and the annual static tables, OSEP has developed a new static table based on the local education agency maintenance of effort reduction and coordinated early intervening services data file. The Center for the Integration of IDEA Data recently published a brief on improving data quality. "Data Quality Through Data Integration: How Integrating Your Data Will Help Improve Data Quality" illustrates the impact of integration on data quality by discussing three scenarios along the continuum of data integration: not integrated or siloed, in the process of integration, and fully integrated. A new study finds that 48 percent of early elementary school students had parents who reported that one barrier to their involvement was the inability of family members to get time off work to engage with the schools. "Barriers to Parent-School Involvement for Early Elementary Students," a new Statistics in Brief released by ED's National Center for Education Statistics, examines the level of parents’ involvement in activities in their children’s schools, describes the types of barriers to participation that parents face, and shows how the barriers to involvement that parents report differ across child, family, and school characteristics. Researchers at the University of Nebraska-Lincoln tested the efficacy of the Getting Ready intervention. It is designed to improve learning and developmental experiences for preschool children with delays by strengthening relationships, creating partnerships, and promoting continuity across education experiences at home and school. To learn more about this project, view a video of an interview with Sue Sheridan, the principal investigator for this project, as she provides an overview of the project and future directions for this research. 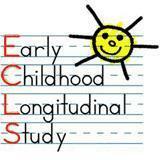 This study was funded by ED's National Center for Special Education Research. The United States Department of Health and Human Services' Office of Child Care (OCC) in partnership with ED's Office of Elementary and Secondary Education (OESE) awarded 45 Preschool Development Birth Through Five (PDG B-5) initial grant awards in December 2018. The PDG B-5 grants differ significantly from the previous Preschool Development Grants. These new grants are designed to fund states and territories to conduct a comprehensive statewide birth through five needs assessment, followed by in-depth strategic planning. The grants also enhance parental choice and expand the current mixed-delivery system consisting of a wide range of provider types and settings, including child care centers and home-based child care providers, Head Start and Early Head Start programs, state prekindergarten programs, and home visiting service providers across the public, private, and faith-based sectors. More information about these exciting new grant awards can be found on the OCC website. In response to inquiries regarding the requirement for statewide procedures for entering and exiting English learners (ELs) from EL status and language instruction programs, ED released the Addendum to September 23, 2016 Non-Regulatory Guidance: English Learners and Title III of the Elementary and Secondary Education Act, as Amended by the Every Student Succeeds Act. This non-regulatory guidance addresses ELs with disabilities in the answers to questions 4, 6, 9, and J-1. Click here for other EL resources. OSEP will present at the National ESEA Conference with colleagues from OESE on a number of topics, including leveraging funds to meet student needs, closing equity gaps through intentional alignment, supporting ELs, and providing updates from ED. 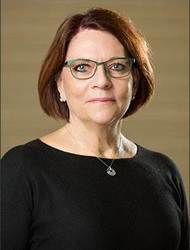 The Office of Special Education Programs will hold its 2019 Leadership Conference July 22 – 24, 2019, at the Crystal Gateway Marriott Hotel in Arlington, Virginia. Conference registration is anticipated to open Feb. 1. Call for Proposals (breakout and poster session submissions) is anticipated to open Feb. 1. Keep track of all conference updates on the 2019 Leadership Conference website. OSERS is on Twitter with the latest tweets from special education advocates, educators, families, and students. Follow us @Ed_Sped_Rehab and tell your friends. Follow Assistant Secretary Johnny Collett @JCollettOSERS. We'll see you in the Twittersphere! You can also check out the IDEA website newsletter archive for past editions of the OSEP Update. Readers are invited to send their feedback on the newsletter to rebecca.walawender@ed.gov. If you know someone who would like to subscribe to the OSEP Update and breaking news, encourage them to sign up HERE! This link will also allow subscribers to manage their subscriber settings and unsubscribe.